Quickly simmer a pot of soup to enjoy on a cool Spring evening. The kind Germans call "Eintopf" - one pot meal. Easy to make, easy to clean up, very economical and very, very delicious! Put the oil and bacon into a 6 qt. pot and cook over medium-high heat until crisp. Remove with a slotted spoon and transfer bacon to a paper towel-lined plate; set aside. Add onion, celery, carrots, and celery root, season with salt and cook, stirring occasionally, until soft, about 10 minutes. Stir in flour; cook, stirring for 3 minutes. Add parsley, thyme and bay leaves to the pot along with the peas, ham hock (I used the turkey leg because it's a more milder smokey flavor) and 8 cups water. Bring to a boil, reduce to low and simmer, covered, until peas are very tender, about 1 hour. Remove and discard thyme sprigs and bay leaves. Add turkey meat if desired. Season with salt and pepper and sprinkle with reserved bacon. *If you cannot find celery root or don't care to use it, substitute, potatoes, or turnips! Sharing with Easy Natural Food - Sunday Night Soup! Yum! 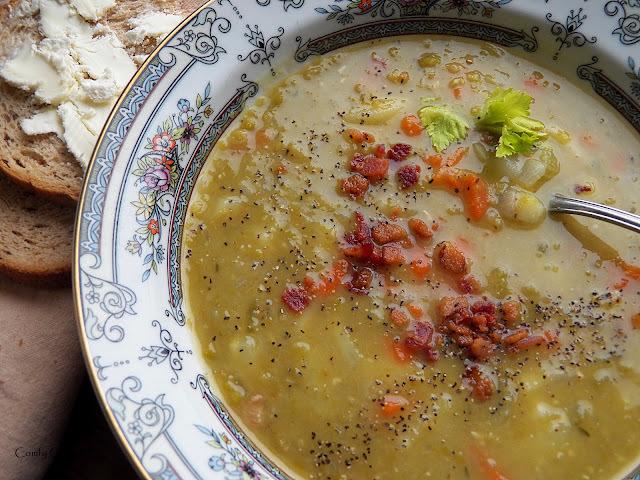 I have a weakness for split pea soup :) Especially with ham....or bacon...or why not both? (great idea!) This looks so tasty, I'm going to Pin it so I can keep drooling :) Thanks for sharing this with Sunday Night Soup Night, look forward to seeing you again soon!